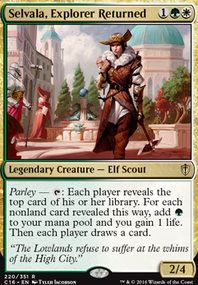 Soul's Majesty / Rishkar's Expertise : What's wrong about these cards in the context of my deck is that the strongest creature in the deck is Woodland Bellower and Regal Force . Best case scenario it's a 5/6 drop to draw 6/5 cards at sorcery speed (Rishkar possibly cheating something out, which is the only reason it's enticing). Otherwise, it's more often than not going to draw 4 off of Yeva. Harmonize : Something about this is super unappealing. The sorc speed, it leaves no body. 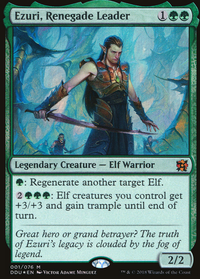 It also hurts my curve and cost too much to leave me open and incapable of responding to stuff going on in my opponent's turn, which is why I avoid sorc speed cards unless absolutely necessary, in favor of cards like Sylvan Library . Bear Umbra : I can see why you would want me to try this in the deck, but it's out for the same reason I wouldn't want to try Wilderness Reclamation . I used to care about untap effects, but now I prefer them in the form of an instant or at the very least a creature that can do it for a very low cost like Wirewood Symbiote . Last, but most important reason is the fact that I have a super low amount of lands in the deck. Most times I win with 3-4 lands at most, meaning the deck depends on its creatures and rocks for mana more than it does on the lands. In fact, I usually make it to 3-4 lands before the deck outright stops giving them to me. Thanks for taking the time to comment, and I hope I was able to answer your questions. If I'm not mistaken, there is a way to use Glimpse without Gaea's Cradle that uses only core cards available even to the budget builds. Apologies if somebody already posted a solution. I'll outline my thoughts. Let me know if I'm missing something here. Given that you are generating mana and drawing through your deck, let's assume you reach the point where your library is empty. Let's further assume that because you've seen your library that you have played out the subset of permanents necessary to combo (all with summoning sickness), and you have destroyed or bounced any taxing effects. You have at least Green Sun's Zenith in hand, floating, and once-per-turn resources that could be activated have already been used. Two Nettle Sentinels untap; Birchlore-tap them to add . Fail to find. Shuffle GSZ in. Repeat all steps, gaining one mana for each full cycle. In this way you can generate arbitrarily large amounts of and . Now you execute the rest of the plan, making sure to play/reshuffle GSZ only after you play Winds of Rebuke and before you replay Nantuko Tracer . Came here from reddit! Nice deck you got there! 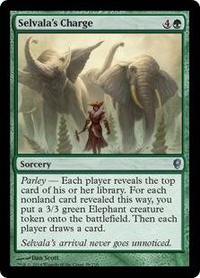 I just finished My take on mono green elves but with this list I am already changing things up to splash black! However I suggest you try out Wirewood Symbiote ! It is great in my deck and with black you are even able to play Shaman of the Pack a second time! 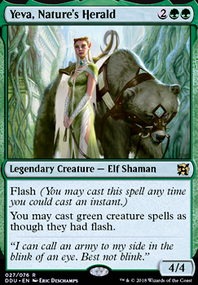 Hey, you're missing Command Tower :) There's a few creatures who when they ETB can untap a creature this is very good with Vannifar to chain activations a turn. Quirion -> Scryb -> Bounding -> Hippocamp -> five drop (Acidic, Mulldrifter , Peregrine, etc.). Quirion and Scryb can be repeatable untap of Vannifar each turn by bouncing a Forest. Wirewood Lodge and Minamo, School at Water's Edge are lands that can untap Vannifar. Thousand-Year Elixir can give Vannifar haste as well as untap her. Fatestitcher is a good four drop here since he can be repeatable untap or be untap when unearthed. Mana dorks are good with Vannifar. Playing her possibly turn three and then they can be used as fodder to get two/three drops. 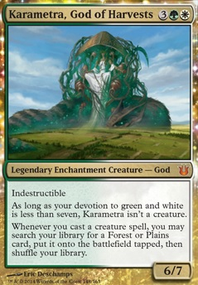 Kiora's Follower : can untap Vannifar or a land. 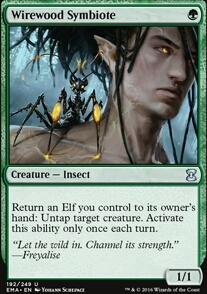 With these Elves Wirewood Symbiote can be another repeatable per turn untap of Vannifar that's also good with Sage, Visionary, Farhaven Elf , Coiling Oracle , etc. Woodland Bellower is great to tutor for Witness to then also recur a creature you saced or any other card in your graveyard. Bellower is a good six drop to Vannifar into Hulk. 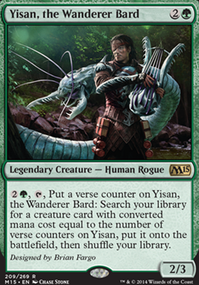 Mystic Snake and Frilled Mystic are counterspells you can possibly tutor for with Vannifar. This interaction is pretty powerful.